If you’re looking for a place downtown for bike maintenance and repair, or in the market for a vintage steel-framed bike, you’re in luck. 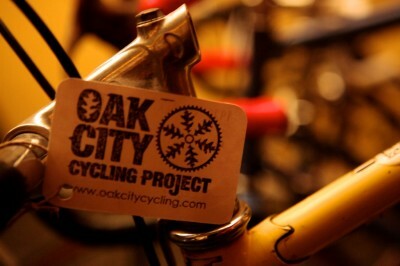 About a month ago, a new bike shop opened its doors in Raleigh: the Oak City Cycling Project. 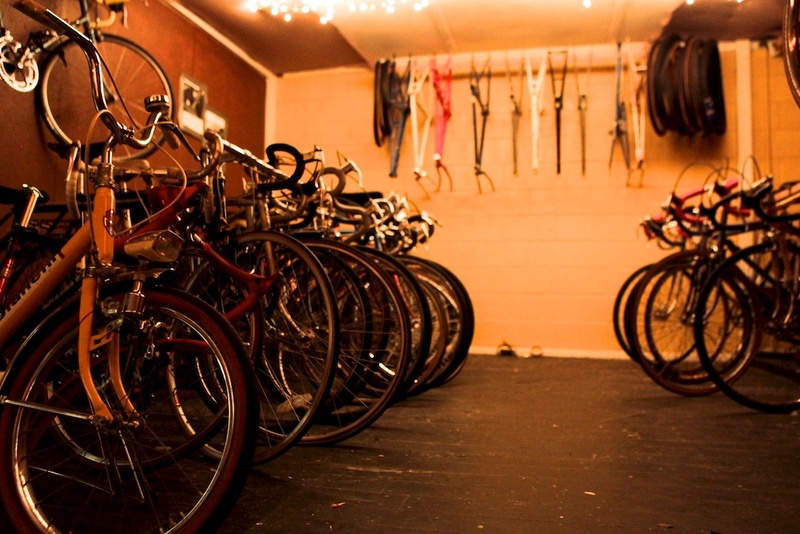 We’re a member-owned and managed cycling shop focused on increasing bicycle ridership in Raleigh through the sale of vintage steel-framed bikes. We restore and sell bicycles that are meant to last a lifetime. Our aim is to get as many folks cycling as possible. We do that by keeping costs low, being transparent about our services and operations, and servicing everyone – from a first time rider to the experienced cyclist. We love what we do. It was originally run out of a back yard until the three found a space in the warehouse art space known as Ruby Red on 726 N. West Street, near where it intersects with Peace Street. When asked about the “project” part of the name, David explained that it is more than a place that fixes up bikes and resells them. 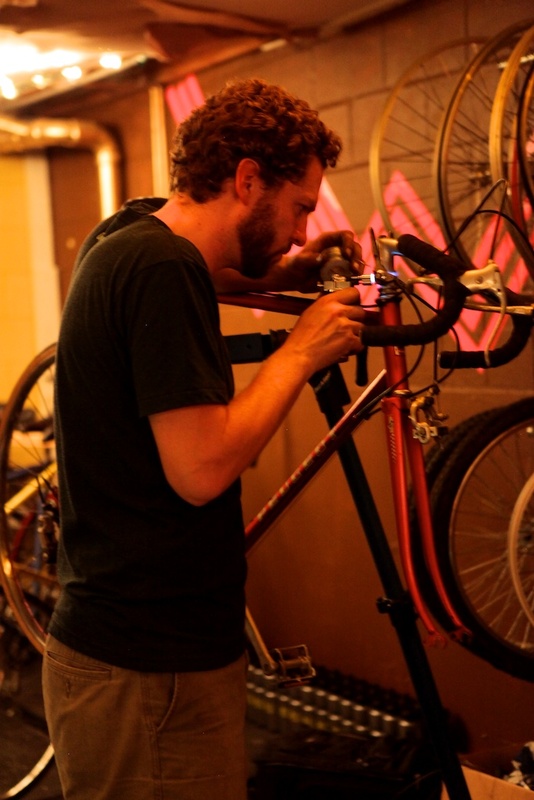 In the short term, they plan on offering open shop hours where riders can use the bike stand and shared tools, as well as get maintenance and repair questions answered. They are also currently working on basic maintenance and repair tutorial videos. 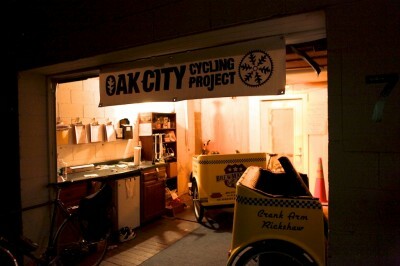 Longer term, the Oak City Cycling Project will have a storefront location downtown with a bit more foot traffic. In addition to the shop, the storefront would also serve as a small batch coffee shop and have a few beers on tap. In a couple of weeks, you can catch up with the guys behind the project as well as other riders in the area. On October 29th, the Oak City Cycling Project is partnering with Crank Arm Rickshaw and Raleigh Bike Love to organize the Scaredy Cat – a Halloween-themed social ride and scavenger hunt followed by bands, beer, and food. It’s great that Downtown Raleigh has this new resource. I look forward to seeing this project bloom and connect more riders in the area. If you’d like to keep tabs on the vintage bikes they restore and put up for sale, you can find them on Facebook as well as the official web site. And even more excellent: Beer and bikes coming soon to downtown Raleigh! Yessssssssss! I often feel a bit out of place in my kit, sitting on the porch at Natty Greene’s, after my afternoon rides. Love it! Making something out of nothing! Hi guys, wrote on your wall, but wanted to post where it would get seen by a lot of people. Your shop is great, we like the way you do things, you even help bike riders like us, that “tricked out” orange Public C7 has gotten good comments from everyone who sees it, thank you for a great bike and all the dress up goodies, class “A” shop shop, class “A” people, you made us feel welcome.